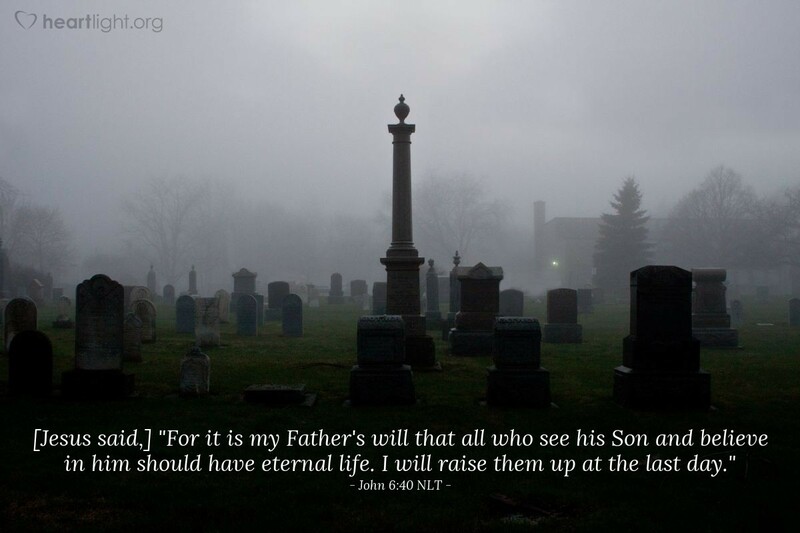 [Jesus said,] "For it is my Father's will that all who see his Son and believe in him should have eternal life. I will raise them up at the last day." So often, people picture God as a surly old man looking for people who mess up so he can punish them. God's will, however, is that all come to salvation. He doesn't want any person to perish. He wants all to know Jesus and find salvation in him. Jesus is the way to God. Jesus is the door to a new and lasting life — not a temporary one, whether real or imagined. Jesus is the focus, the hope, and the life behind God's plan. Learning to believe in Jesus is everything! Learning to see Jesus as God's Son is the doorway to forever! We receive a life that outlasts history and the assurance that nothing can ever conquer us once we belong to Jesus (Romans 8:31-39)! He will raise us up in victory. Thank you, God Almighty, the God of the ages. You are the Alpha and the Omega, and you have given me forever in Jesus. Please fan the fires of faith and keep them vibrant. Help me focus my eyes on Jesus and trust him to lead me home. Give me the wisdom to see through the doubts that Satan places before me. Help me experience the eternal life that begins now and will never end. In Jesus' name, I pray and offer my sincerest praise. Amen.